. Automatic spindle lock for manual use.
.	Textured grip for better control.
. Compact size and lightweight.
.	Retractable screw holder with magnetic tip. Black and Decker Screw Guns combine the features of a cordless screwdriver and a conventional screwdriver. This way, you can use these tools for all your household tasks - even the ones that require that the use of a conventional screwdriver. They come with a spindle lock which you can use to switch from power mode to manual mode and use the tool as a manual screwdriver. One of the features that almost every other reviewer has mentioned is the torque control collar which comes with Black and Decker Screw Guns . It allows you to match to the task you are doing and reduces unwanted strips. Thanks to its neat design, it is very easy to operate and can be used in awkward angles easily. It is easy to hold and there are no risks of operator fatigue even if you work for a long time. Changing bits is a breeze in most of the models from Black and Decker thanks to the user friendly design. The magnetic screw holder in Black and Decker screw guns is something that a lot of reviews talk highly of. It makes it easier to get the screw in and it also has a screw size selector for different types of screws. The torque setting in these screw guns is good enough to handle both standard sized screws and small screws. Some of the models have a folding handle which makes it easier to get into tight, small spaces. Though they are compact and lightweight, they are pretty tough and durable. 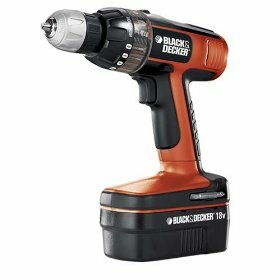 Battery life is the biggest problem with Black and Decker screw guns. A lot of reviewers have mentioned that the tool runs out of battery power very quickly and cannot be used for tasks that take a lot of time. In some cases, bits are not held in place. So, they have a tendency to get stuck in tight spots and fall out. There is no variable speed control available, so you might find it difficult to use at times. Some of the models are quite slow and it could take a while for you to get used to the slow speed - particularly if you are used to working with super fast, powerful screw guns. Return From Black and Decker Cordless Screw Guns Page to Home - Finishcarpentryhelp.com.